I thoroughly enjoyed this book, which is a perfect blend of the thoughtful and the delightful. It's the story of an unusual bond between a world-famous children's book writer and his assistant, as well as his legacy of work. I met the author at our event and asked her if there were plans to publish the fictional teen trilogy featured in the book, and she said that it was not in the works. I believe it should be. A passage about a petition to save a tree enchanted me. Julia Glass’s richly imagined novel begins just after the sudden death of world-renowned children’s book author Mort Lear, who leaves behind a wholly unexpected will, an idyllic country house, and difficult secrets about a childhood far darker than those of the beloved characters he created for young readers of all ages. Left to grapple with the consequences of his final wishes are Tommy Daulair, his longtime live-in assistant; Merry Galarza, a museum curator betrayed by those wishes; and Nick Greene, a beguiling actor preparing to play Lear in a movie. When Nick pays a visit to Lear’s home, he and Tommy confront what it means to be entrusted with the great writer’s legacy and reputation. Tommy realizes that despite his generous bequest, the man to whom she devoted decades of her life has left her with grave doubts about her past as well as her future. 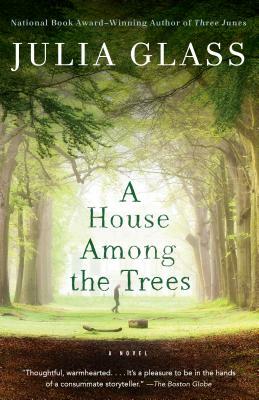 Vivid and gripping, filled with insight and humor, A House Among the Trees is an unforgettable story about friendship and love, artistic ambition, the perils of fame, and the sacrifices made by those who serve the demands of a creative genius. Julia Glass is the author of five previous books of fiction, including the best-selling Three Junes, winner of the National Book Award, and I See You Everywhere, winner of the Binghamton University John Gardner Fiction Book Award. Other published works include the Kindle Single Chairs in the Rafters and essays in several anthologies. A recipient of fellowships from the National Endowment for the Arts, the New York Foundation for the Arts, and the Radcliffe Institute for Advanced Study, Glass is a Distinguished Writer in Residence at Emerson College. She lives with her family in Marblehead, Massachusetts.